In a large pot, heat the oil on medium-high until it shimmers. Add the onion, carrot, fennel, celery, and salt and cook, stirring occasionally, until the vegetables begin to brown, about 7 minutes. Add the garlic and cook, stirring constantly, until fragrant, about 30 seconds. Add the flour and cook, stirring constantly, for one minute. Add the red wine. Scrape any browned bits from the bottom of the pan with the side of a spoon. Cook, stirring, until the wine thickens, about one minute. Add the vegetable broth, soy sauce, potatoes, lentils, rosemary, and pepper. Bring to a boil. Reduce to low and cook, stirring occasionally, until the lentils are soft, 15 to 20 minutes. Serve garnished with the parsley if desired. 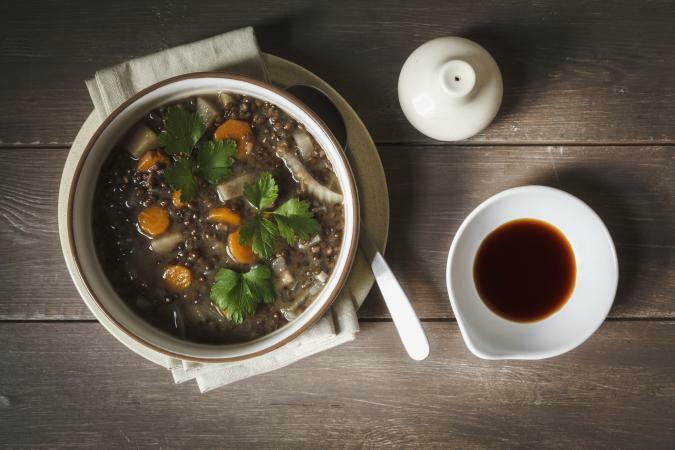 There are many vegan stews you can make using a variety of proteins. Try green TVP curry or TVP stew. Try Moroccan squash stew or vegan chili in the slow cooker. Have some Mexican-style beans without the cheese.